The Uninvited (1944) was based on the best-selling novel Uneasy Freehold by Dorothy Macardle and marked the directorial debut of Lewis Allen who had cut his teeth in the theater with successful productions in London’s West End and on Broadway before heading to Hollywood to work for Paramount. After a brief apprenticeship, he got the gig to direct The Uninvited, which became one of the first Hollywood films to treat the subject of ghosts seriously. Roderick and Pamela Fitzgerald (Milland and Hussey) are a brother and sister team that stumbles across a large, empty house while vacationing on the Cornish coast of England. He is a composer who makes his living as a music critic and she convinces him to make an offer on the house on top of the cliff. They meet with the owner, Commander Beech (Crisp) who amazingly accepts Rick’s low offer and vague warning that the previous tenants did not stay long and left in a hurry. If something seems too good to be true it probably is, but Rick and Pam are swayed by the fantastic price and take the plunge. With the first day of occupancy comes ominous foreshadowing of things to come in the form of a bouquet of flowers that wilt and die suddenly, and their dog beginning to howl at seemingly nothing – although, he is afraid to come upstairs. A trip into town provides Rick with somewhat juicy gossip – apparently Commander Beech’s daughter died at the house and he hates it as a result. Everything seems to be going swimmingly until one night Rick is awoken by the sounds of a woman sobbing uncontrollably. He meets Pam and they search the house, but are unable to find the source of the crying. He tries to reason it away, but it becomes readily apparent that the house is haunted. Actor Ray Milland displays a wonderful light touch early on, like when he goes on an ill-fated sailboat ride with Beech’s granddaughter. Initially, he conveys a hearty bravado only for it to give way to seasickness. Milland garners laughs with his woefully sarcasm during this scene. These moments of humor lull us into a false sense of security so that when the supernatural suspense kicks in we’re unprepared for it. The Uninvited is an atmospheric ghost story enhanced by Charles Lang Jr.’s richly textured black and white cinematography. Along with Allen’s direction, they really create a sense of place, crucial for a haunted house tale. During the day it is a gorgeous place with vast ceilings and immense rooms. During the night the house is enveloped in foreboding darkness, its vast spaces swallowed up by the shadows. In these kinds of films, the house is another character and Allen understands this as he shows how the place affects them. 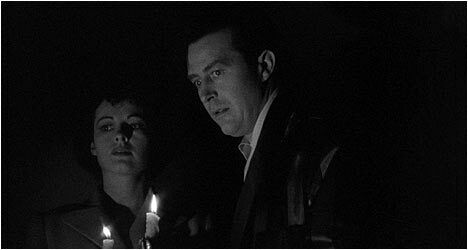 The Uninvited is one of the very best examples of the haunted house subgenre, rich in atmosphere and anchored by believable performances from Ray Milland and Ruth Hussey. “Giving Up the Ghost” is a visual essay by filmmaker Michael Almereyda. He points out that The Uninvited is one of the first Hollywood films to take ghosts seriously. Prior to that they were largely played for laughs or were nothing more than part of a scam by the film’s antagonists. He takes us through the film, analyzing key aspects and providing fascinating anecdotes and trivia about cast and crew. Also included are two radio adaptations – one from 1944 and another from 1949.